Welcome to Southern California, where residents take their pooches out for ice cream at the Hydrant Café, attend an annual Blessing of the Cars, and then climb aboard a hearse for a Grave Line Tour to find out how, when, where, and sometimes why Hollywood's finest died. If you're a sports fan, visit the Baseball Reliquary, home to a partially smoked cigar of Babe Ruth, a fragment of skin from the inner left thigh of baseball pioneer Abner Doubleday, and the gold-plated shovel used by Angels owner Gene Autry during groundbreaking ceremonies at Anaheim Stadium in 1964. And don't forget the world's largest champagne glass, still bubbling away at the Lawrence Welk Museum. With this book in hand, readers will be sure to laugh as they learn what lies way off the beaten path in this part of the Golden State. Southern California Curiosities is your round-trip ticket to the wildest, wackiest, most outrageous people, places, and things the lower half of the Golden State has to offer. Humorist and veteran journalist Saul Rubin has traveled way off Southern California’s beaten path for one-of-a-kind gems that make his home turf truly unique. You’ll meet the world’s loudest finger snapper, a man who teaches etiquette to camels, and a couple who built a house that spins. You’ll discover the best places to eat raisin-sweet-potato pie, drink a date shake, or sample strawberry nachos and pizza. You’ll tour an egg collection, a house of trash, and a burlesque museum featuring Gypsy Rose Lee’s glove collection, Sally Rand’s ivory-handled fans, and costumes from the likes of Blaze Starr, Lili St. Cyr, and Chesty Morgan. 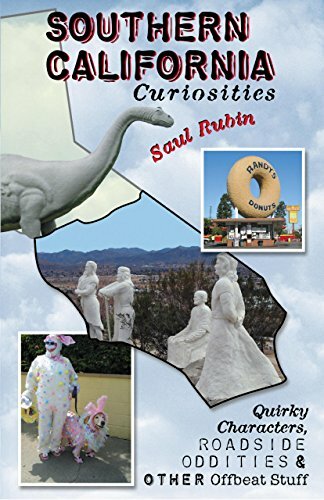 Whether you were born and raised in Southern California or are a recent transplant, Saul Rubin’s home-grown humor will have you laughing out loud as he introduces you to the neighbors you never knew you had and takes you to places you never knew existed - right in your own backyard. Saul Rubin is a veteran California journalist who has covered everything from major disasters to stories highlighting the state's quirky inhabitants and culture. He has hobnobbed with celebrities while an entertainment writer for the Los Angeles Times, and chased down sports figures while writing and developing stories for a national sports magazine show on Fox Sports Net. As a staff feature writer for Copley Los Angeles Newspapers based in Santa Monica, California, Saul penned a weekly humor column. He also developed a regular feature that chronicled his often hilarious experiences while working odd jobs around Los Angeles for a day. His temporary employment pursuits included stints as a mall Santa, Little League umpire, golf range ball retriever and peanut vendor at Dodger Stadium. Saul is the author of two books, Offbeat Museums (Santa Monica Press, 1997) and Offbeat Marijuana (Santa Monica Press, 1999). Both books were part of this independent publisher's series on offbeat culture. The Museum book was widely praised by sources such as ABC's "Good Morning America," CBS's "The Early Show," USA Today and the Los Angeles Times. The book tells the story of 50 of America's most unusual museums, as well as depicting the story of the people behind each quirky institution. Offbeat Museums was reissued in hardcover by Black Dog & Leventhal Publishers in 2002. The Marijuana book tells the story of one of the world's most controversial plants and was commended for its frank humor and comprehensive history. Saul is now a full-time journalism instructor at Santa Monica College in Santa Monica, California, the state's top two-year college. He is a graduate of the University of California at Berkeley's Graduate School of Journalism, and was also awarded a Bachelor of Arts in English from U.C. Berkeley. Saul grew up in the Boston area but has now lived more than half his life in California. He lives in the Los Angeles area with his wife and daughter.